This introductory chapter presents a general overview of the edited volume. 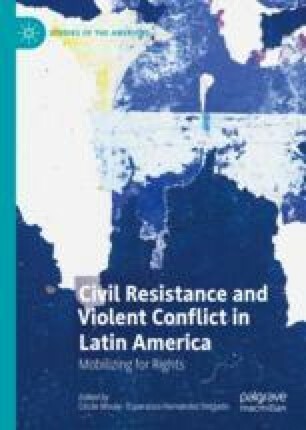 It defines key concepts, such as “civil resistance” and “violent conflict”, and explains the relevance of studying civil resistance in contexts of violent conflict in Latin America. It argues that nonviolent resistance has become a key way for grievance groups to develop and wield power to defend their rights and achieve social change. These groups have engaged in nonviolent resistance to achieve different objectives, including fighting against authoritarianism, armed violence, and the possible destruction of their natural resources, culture or ancestral territory. They have also faced different opponents and used different strategies and methods to achieve their objectives. This chapter also briefly talks about the contributors’ research methodology and ends with a brief description of each chapter to guide readers through the book.